The proposed extended wave 5 is important in that a strong guideline suggests that once completed, prices will reverse rather quickly to at least back to the origin of wave 5 itself. 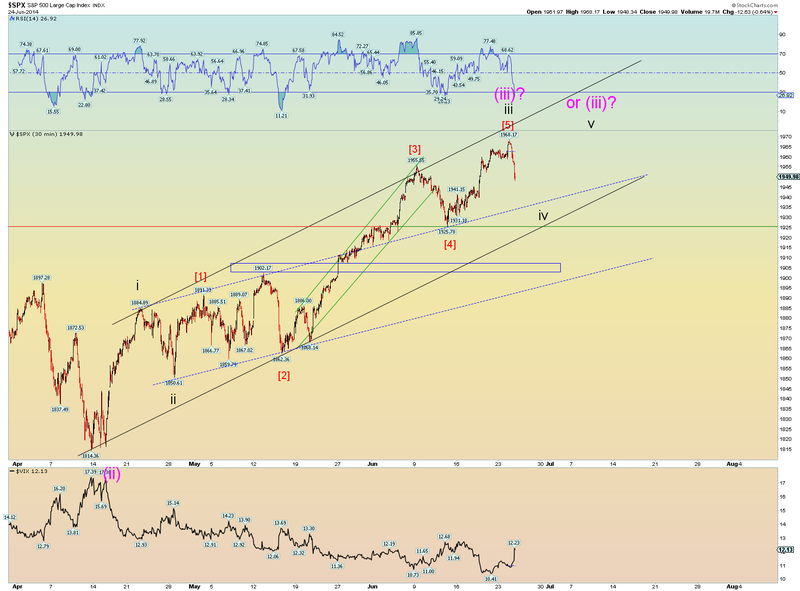 This is because an extended wave 5 means the market has overextended itself so quick reversal is the guideline. 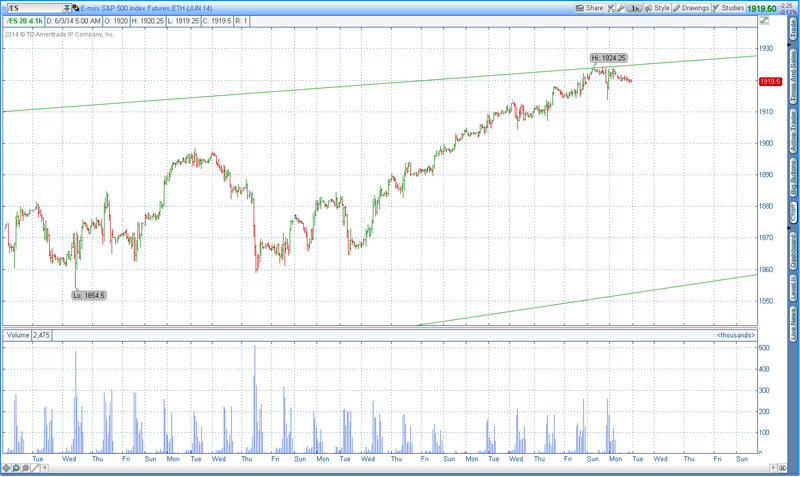 For the SPX the beginning of wave 5 was 1560. So again, after completion of cycle b, we can expect a downside "kickoff" wave (for cycle wave c) to take us back squarely under 1560 for starters. And since the wave 5 price advance took 12-14 months, expect the trip back to 1560 or below to take a few months at most or even only a few weeks. But at this rate, we have to endure the final waves to play out first. The size of the pattern suggest waves (iv) and (v) of [v] may take several weeks or more but be on your toes. 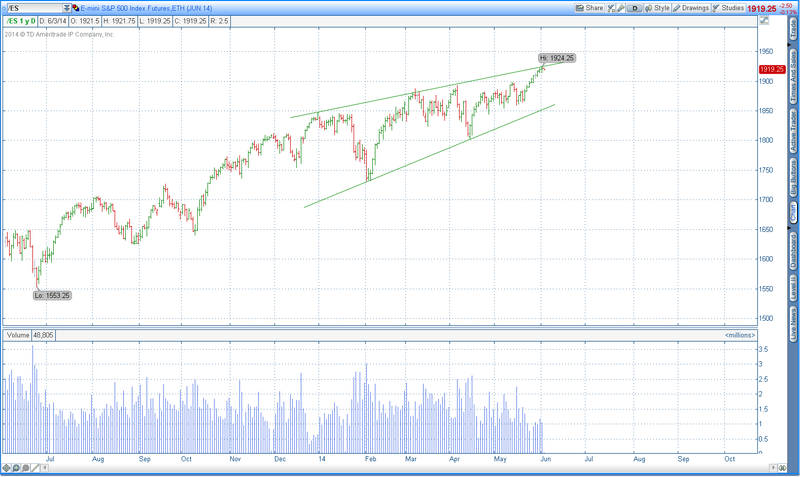 This count squarely has SPX 2000 or slightly higher in sights. A final cycle high of 2,014 SPX points would fitting. 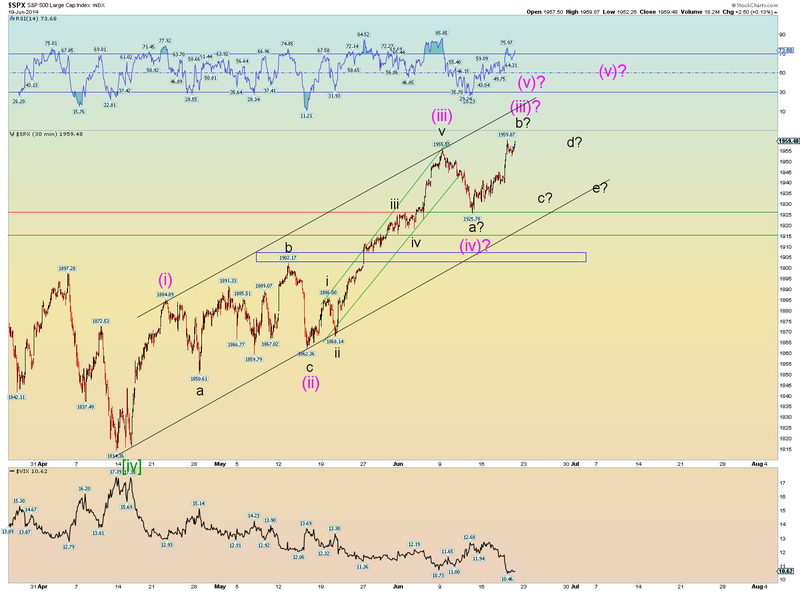 Here is the proposed extended wave 5 in a detailed count using the Wilshire5000. A convincing argument that this structure is correctly started is by way of a small leading diagonal triangle at the beginning. Among all the other arguments presented in last night's post, that little LDT only makes sense at the beginning of a new wave structure as we have labeled, specifically Intermediate wave (C). The channeling for the subwaves of Minor 5 is narrower which also makes sense. 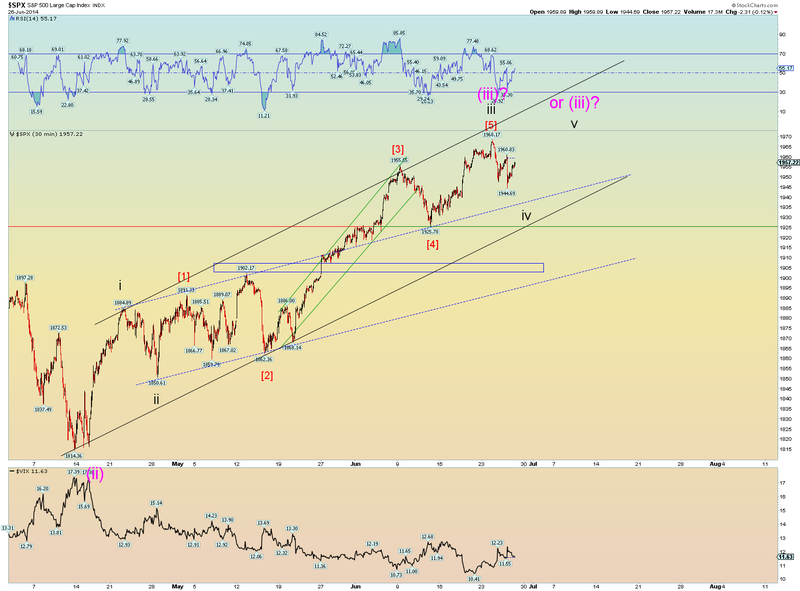 Again, short term we are trying to confirm the top of wave (iii) of [v] of 5. 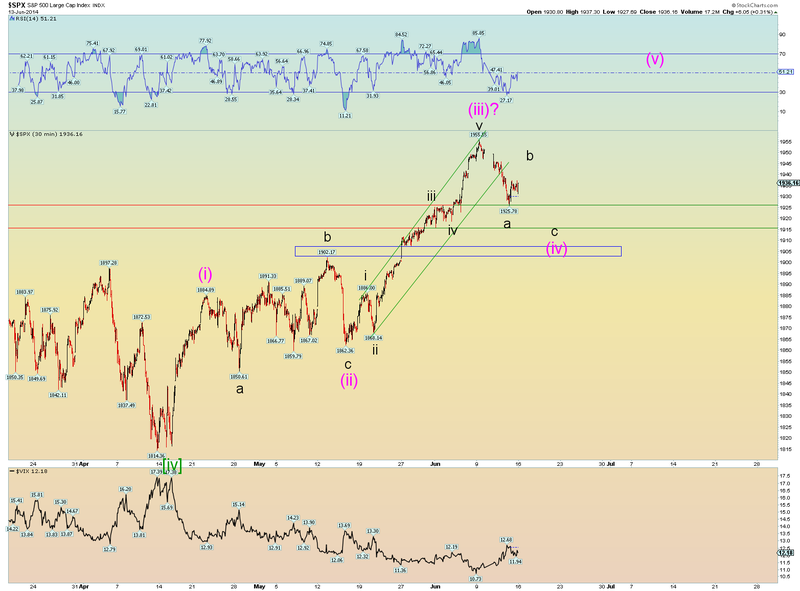 Now lets examine Intermediate wave (c) of [Y] and see if it "fits" as an extended wave 5. 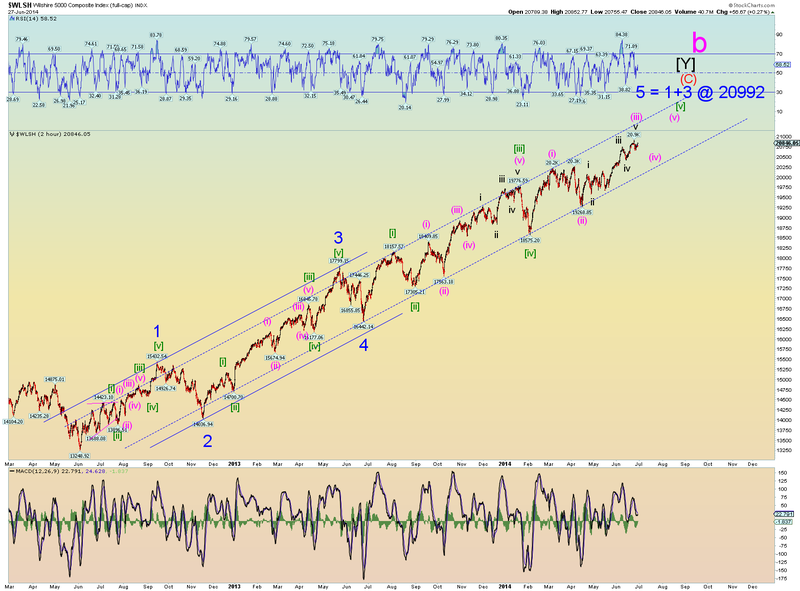 1) We have wave 3 at a very nearly perfect 1.618 ratio of Minor wave 1. 2) We have a solid channel which indicates the entire structure is likely one 5 wave move. 3) We have three distinct what I call "blue box virgin wave areas". These are the price accelerations that mark a middle of a third wave. There is no price high prior nor after these identifiable areas. They mark separate third waves in each instance. In an extended wave as proposed we can expect to see exactly 3 specific virgin areas as outlined in the exact count formation as shown. 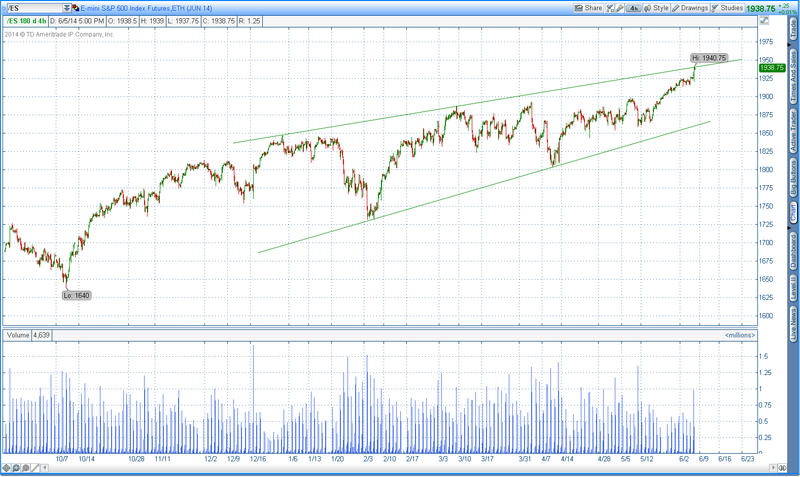 The "key" wave marker area for this entire structure in my opinion is 1902 SPX, the top virgin area. If this is breached, then you can infer that the count is complete. Conclusion: No one can be certain of anything at this stage but the argument for the count above fits the most Elliott Wave rules and guidelines so therefore it is our primary count. 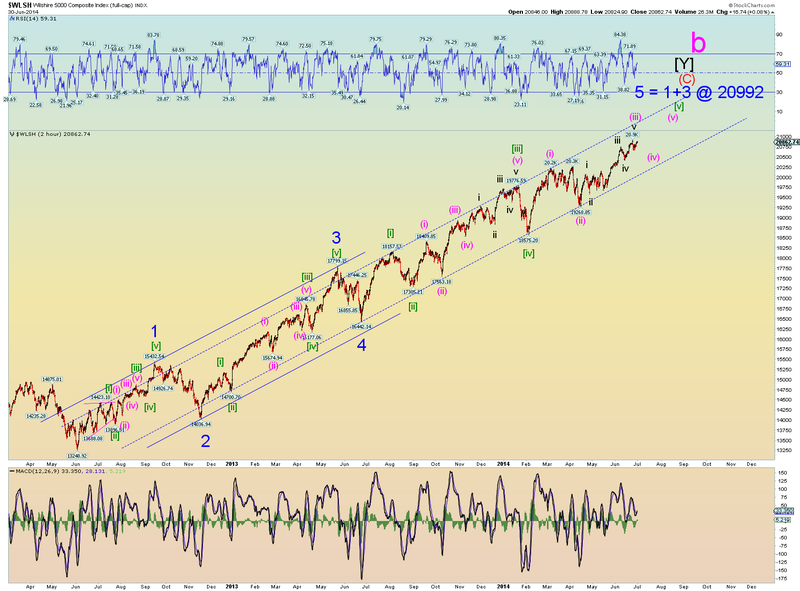 Again the weekly shows a potential extended wave Minor 5 of Intermediate (C). 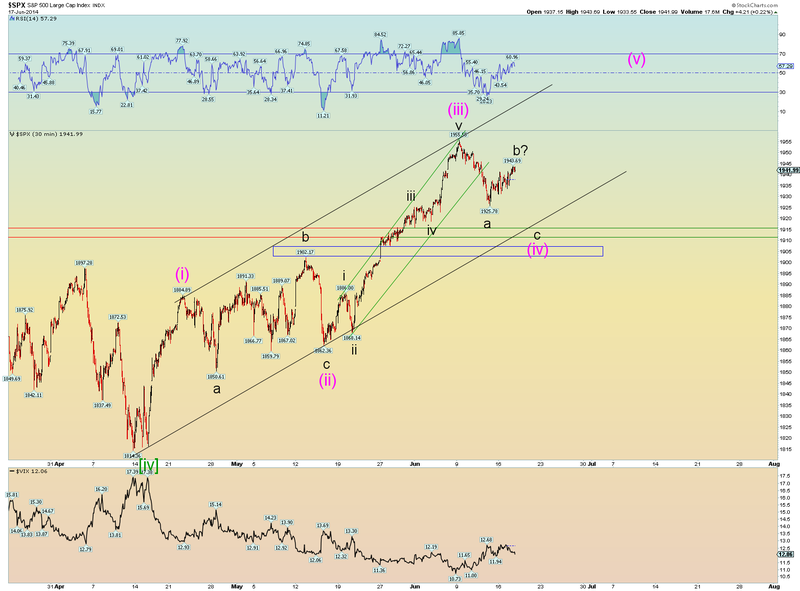 The 30 minute SPX chart was incorrectly showing the wrong price points for the start of waves (i) and (ii) of [v]. But it doesn't change the fact we are still trying to confirm the top of wave (iii) of [v] perhaps today was the day. 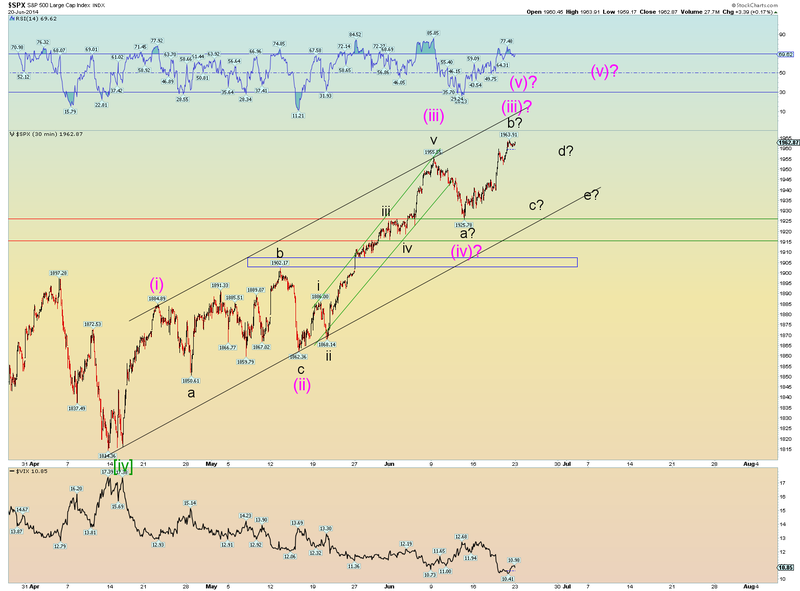 The count is corrected and the use of a 60 minute chart for the final wave [v] is below. Note the blue virgin space rectangle box in the proposed middle of wave  of iii of (iii). And yeah, the wave structure has the potential to drag out all damn summer long. 1902 SPX is the key level here. The virgin space really shouldn't be breached unless and until the entire 5 wave structure is considered complete. 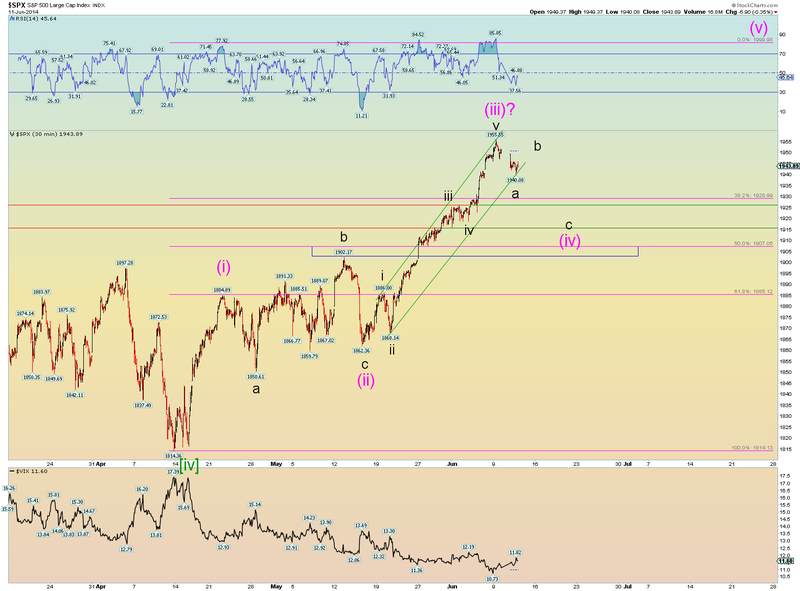 The corrected 30 minute SPX showing proper subwave degrees. Again still trying to confirm the top of wave (iii) of [v] of 5 as shown on the weekly is the best count going for us. The short term patter will resolve itself. 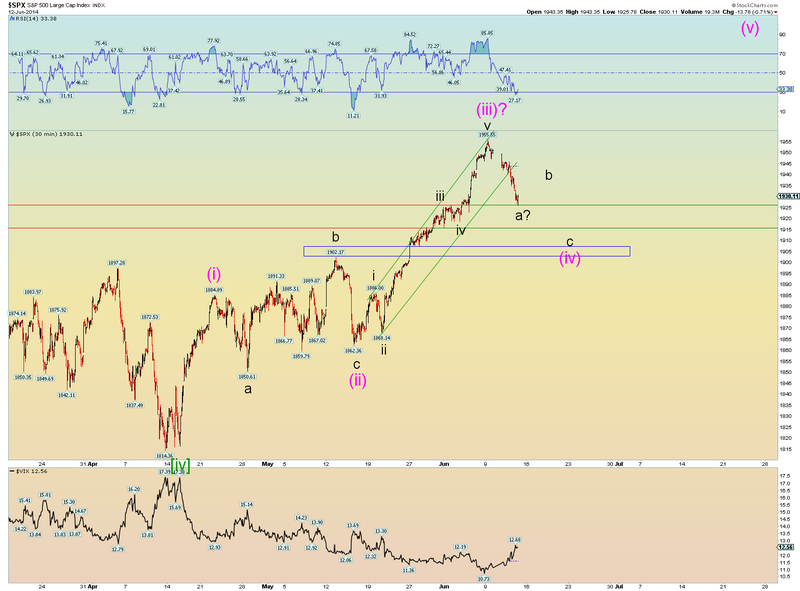 A closing price below 1902 will indicate that Cycle wave b counts as complete. Currently there are many short term options however the strength of the close today suggests that wave (v) is tracing out and not some kind of b of (iv). Lots of short term options. These things will sort themselves out as the wave structure continues to develop. 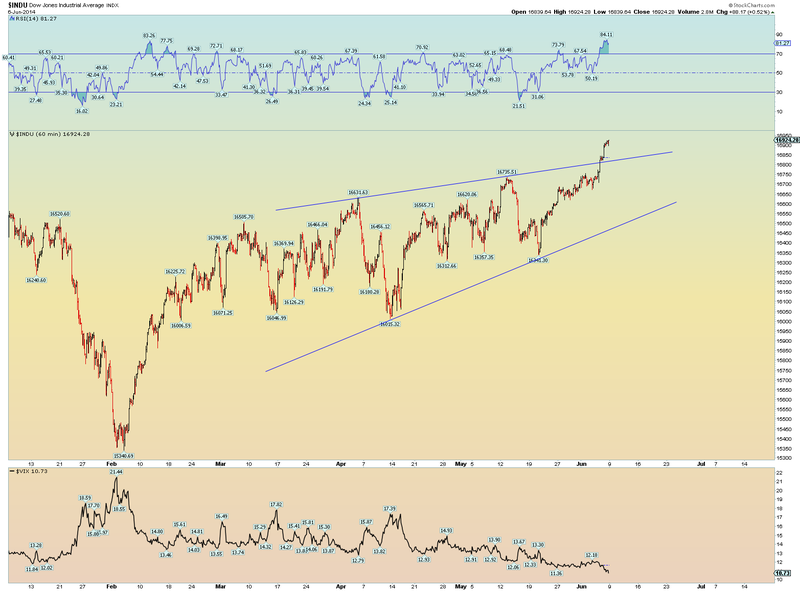 Updating our charts from last week as the count still seems to be working. GDOW (and an example of an extended wave five although at a different degree). And since the cycle wave a counts as 5 waves down, we shouldn't expect a new all-time high. That makes cycle wave b the middle wave in a 5-3-5 zigzag pattern down which would comprise the whole of supercycle wave (a). So by rule a zigzag cannot have wave b higher than the start point or its not a zigzag. However the 5 waves down suggests it can only be a zigzag with 5 primary waves down for cycle wave c. This would then match what we expect for cycle wave c for the US markets - a 5 primary wave down pattern. By the way, wave [C] of b equals wave [A] of b at 2572. We are remarkably close to a 1:1 ratio. It makes a wonderful "three" pattern which implies corrective. Which of course implies its a bear wave rally. Those of you who doubt the patterns on the US markets should really take a hard look at the GDOW chart which produces excellent waves. And its riper for finishing up. Updating the charts presented last night. The 1915 - 1926 target range mentioned last night for wave (iv) of [v] has already been met. However it doesn't look completed if this is wave (iv). Not enough time nor does it count as a three. The "rule" is that wave (iv) cannot enter the price range of wave (i) of which the orthodox top is 1884.89. 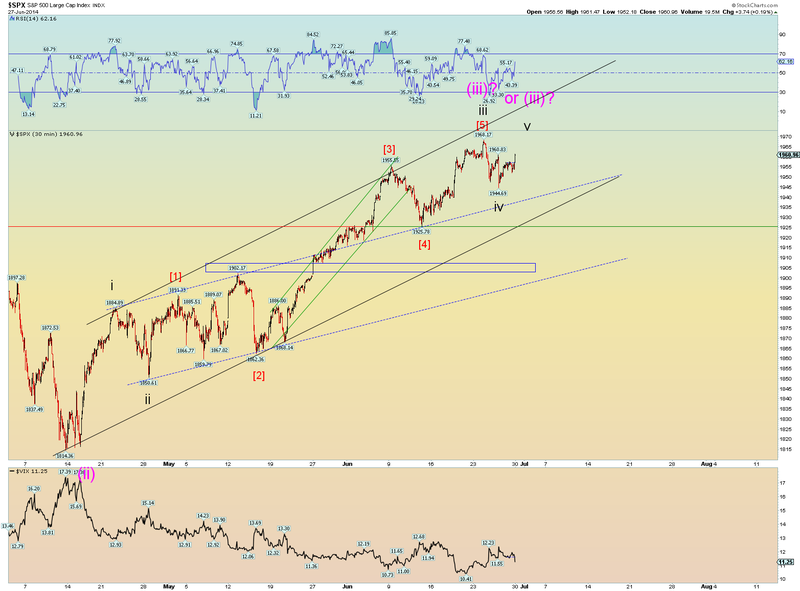 However wave b of (ii) actually exceeded that at 1902.17. So in reality any further pull back really shouldn't be heading that low for it to be a wave (iv). This count would be highly suspect if it had pulled back as far as 1900. 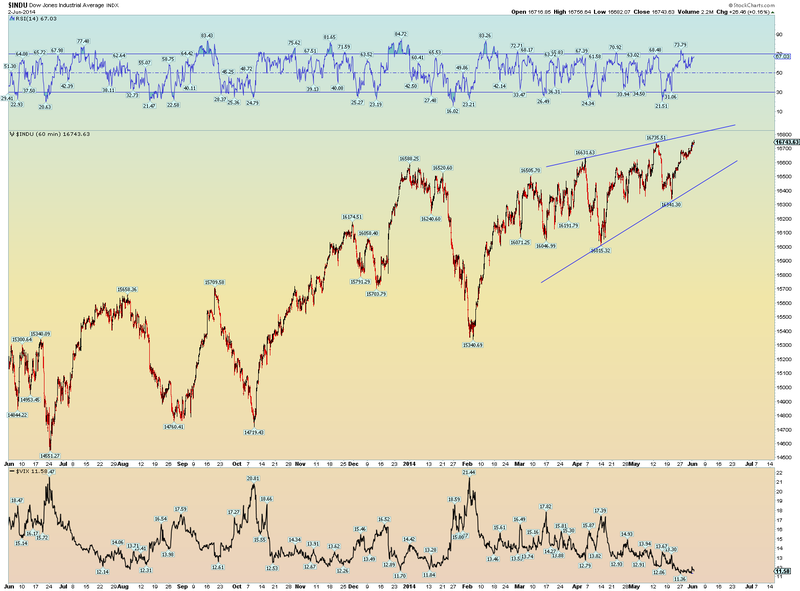 If it does, then consider the cycle wave b count complete. No update last night because Stockcharts lost their data feed all day. There are a few logical questions to ask ourselves, for after all, at the end of the day, EW theory is a logical theory when it comes to basic wave counting. The best counts incorporate the largest number of guidelines (channeling, "look", Fibonacci relationships, etc) and of course the few hard rules (wave 4 never moves into wave 1 territory) should never be broken to "make" a count work. At the same time we have to make an educated guess as the waves are unfolding if we are part of an impulse pattern (bullish) or corrective pattern (bearish) and at what degree of trend. It happens that our best count for the long term happens to be a corrective upward pattern - albeit very large - of a cycle-sized b wave that is "correcting" the previous cycle-sized a wave that had preceeded it. 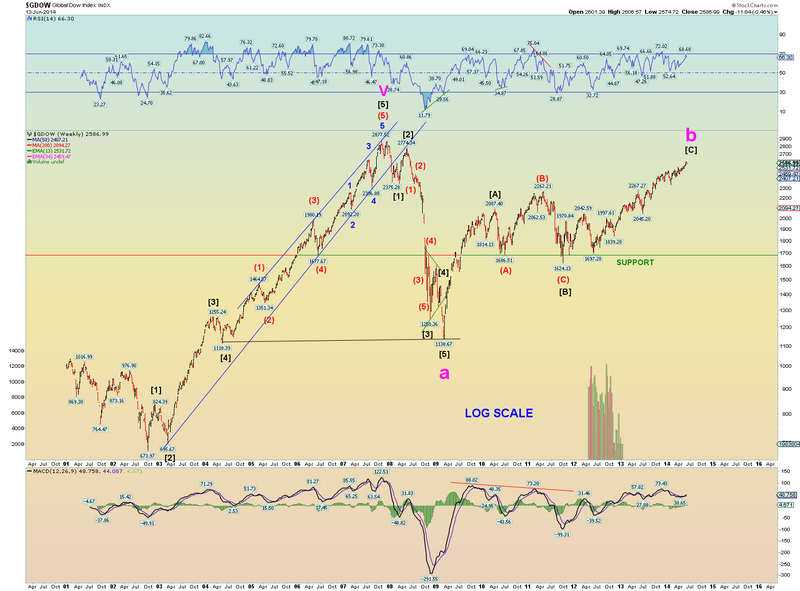 This long term count is reflected nicely in the Wilshire monthly chart below. 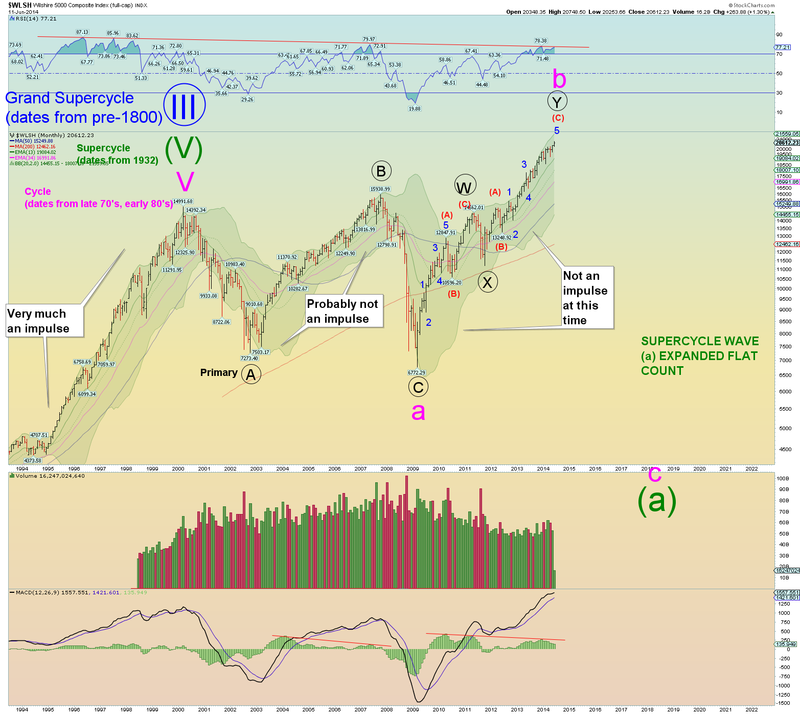 So what makes cycle wave b an upward corrective pattern (which is of course the "middle" wave of a three wave Supercycle corrective pattern)? Because it counts as a "three" wave pattern. The large corrective primary [X] wave in the middle makes it so. In other words using guidelines and rules it fits better into this count than anything else. I didn't have to "shoehorn" it into a count that I would prefer. 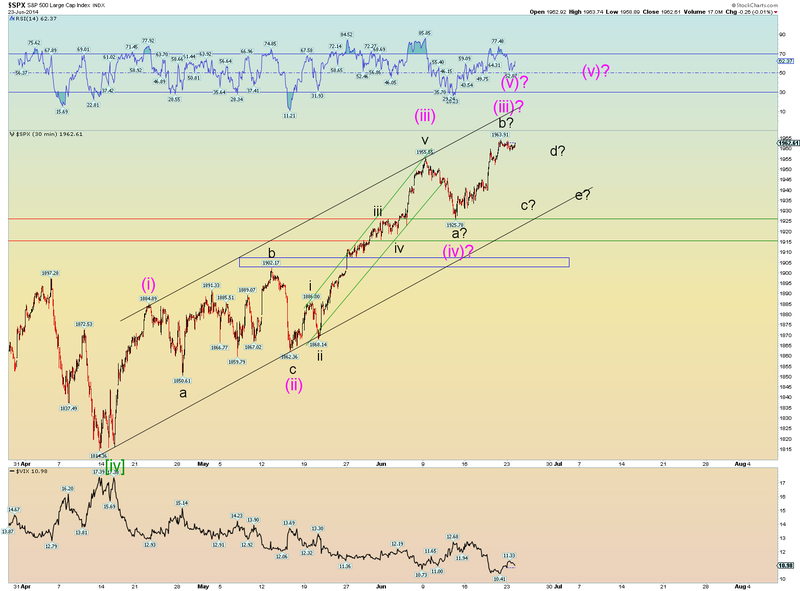 I can merely see the count works better as a corrective pattern rather than impulse. A closer look at cycle wave b also shows some quirks that make me want to label it the way I have it shown below. First anomaly is the fact that the next largest correction besides wave [X] is wave (B) of the first zigzag [W]. 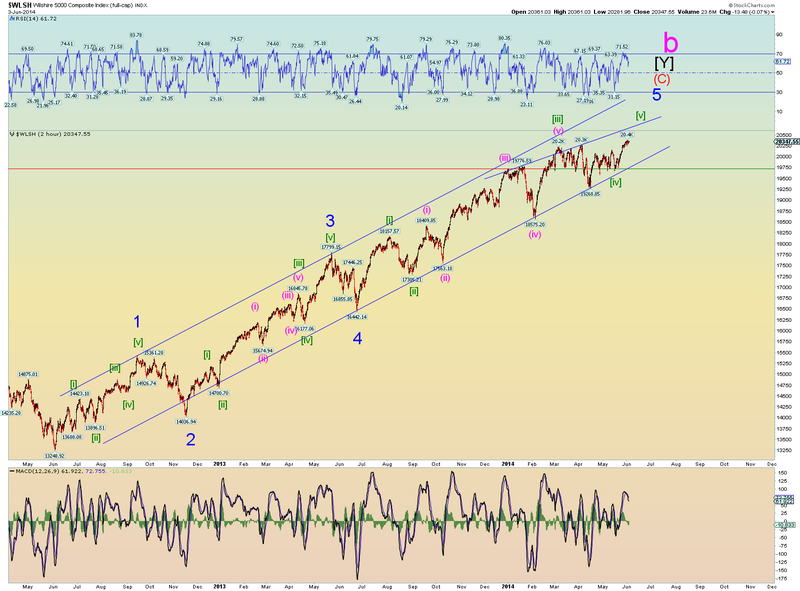 Simply put it does not look right to call wave [W] a 5 wave pattern. 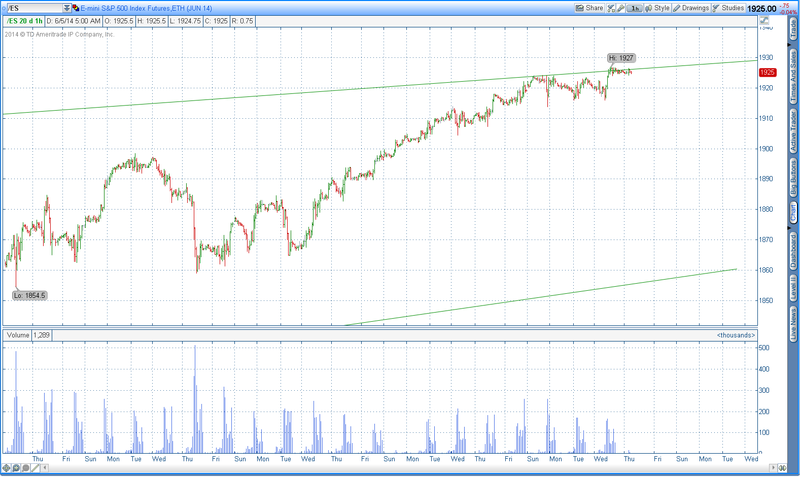 It counts and looks better as a three wave pattern. Since the SPX will for all practical matters, be in the same count as the Wilshire5000, here is the SPX weekly. Note the "extended wave 5" count of the last wave (C) of [Y] of b. This is again, per the textbook EW principles (Frost and Prechter). I had first suggested this count back in April because of the significance of a third Zweig Breadth Thrust event that had occurred. And the length of time and price of the rally has confirmed that the 3rd ZBT event was indeed lasting and meaningful. 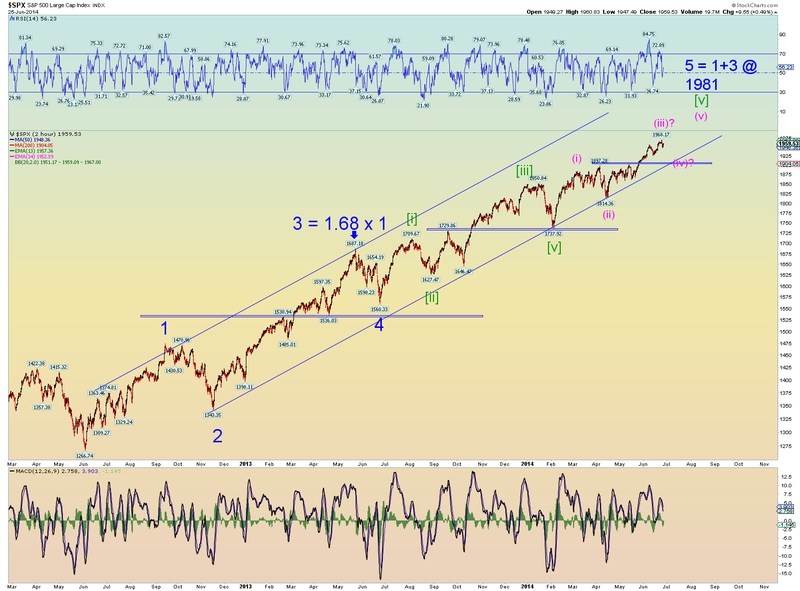 So the question on the smaller scale is where are we at in the extended wave 5? Well the best answer again using EW guidelines is we are trying to determine if wave (iii) of [v] of 5 has peaked. It may have but we need a few more days evidence. Its internal structure of wave (iii) counts as finished in a nice way. It "looks" right and it is longer than wave (i) so it is not violating that strong guideline. I would propose that since wave (ii) was somewhat complex and "sideways" that wave (iv) should be simpler (like a 5-3-5 zigzag) and be less complex. .
Another guideline of wave (iv) is that it usually corrects down into the price range of the previous subwave iv of (iii). That range is 1916 - 1926. 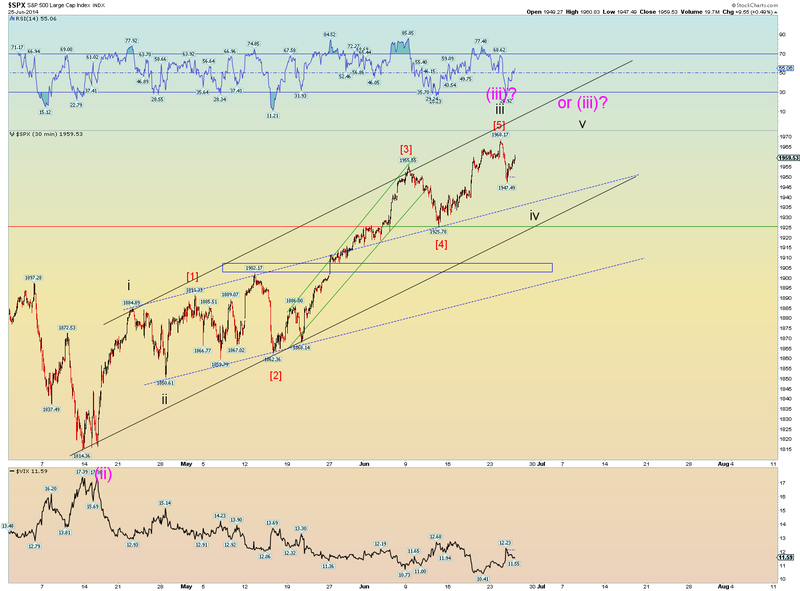 That would where we could expect a price low of wave (iv) to occur. And then wave (v) should, at minimum, should carry prices to a new all time high. 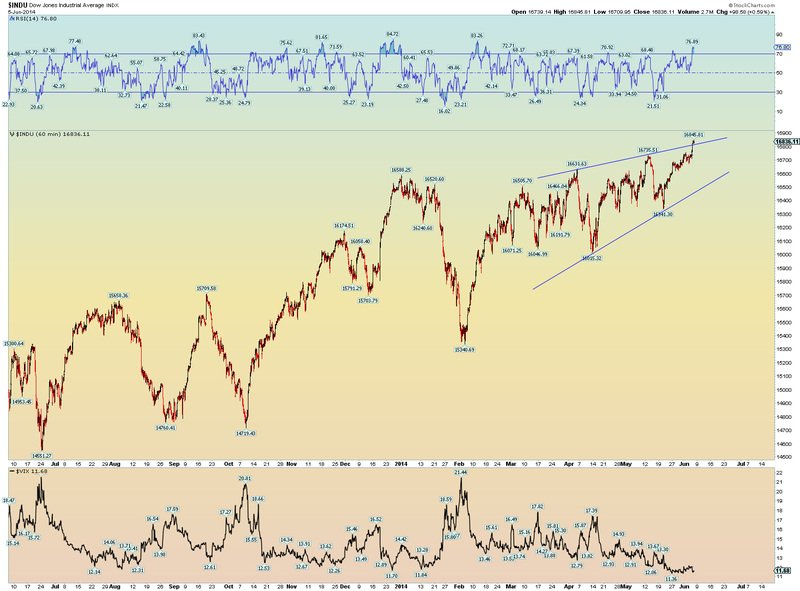 And that may be anywhere from 1975 - 2000 SPX if the wave is to "look" right. 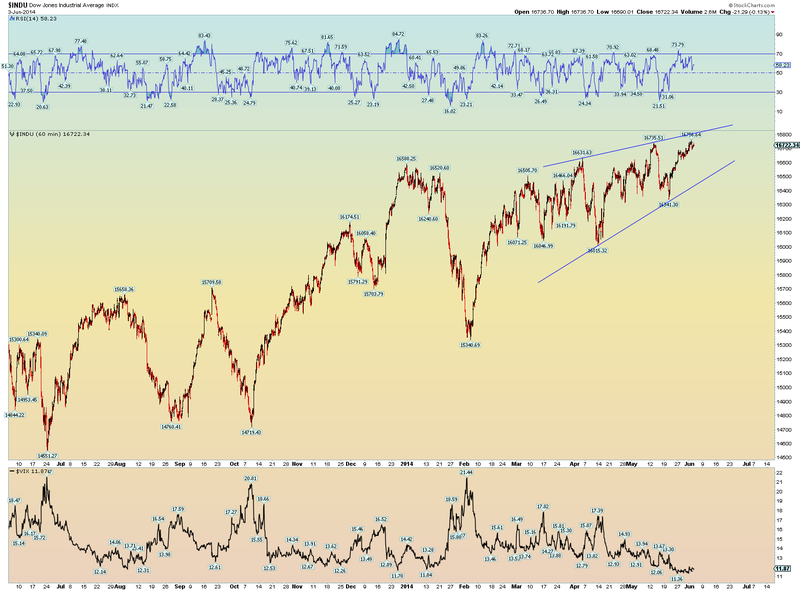 Probably carry to 2014 to make for a nice long term price top. Again all of this wave counting starts from the largest - Supercycle projection, cycle count, etc, down to where we are now - counting out the last waves of a possible extended wave 5. It all "fits" and its the best we can do. One last note about the SPX weekly above; the last Zweig Breadth Thrust event occurred as wave 5 was just starting to unfold. This was the internal "push" that signaled it was going to extend. 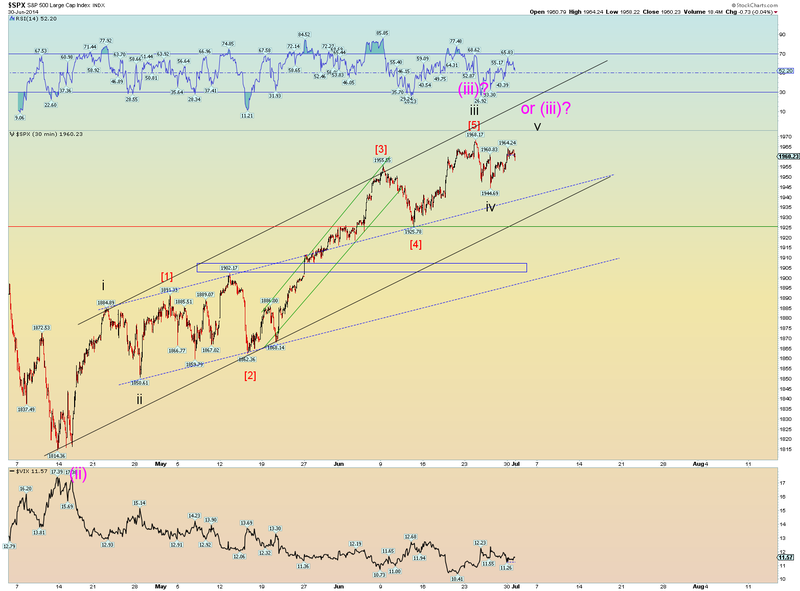 An extended wave 5 implies that the market has stretched itself too far. 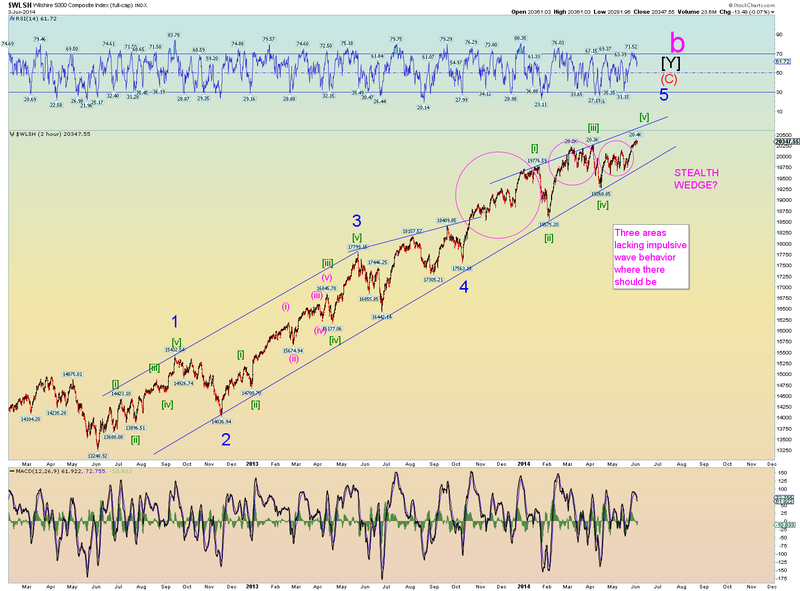 And again EW theory guidelines state that extended wave 5's, after their completion, reverse the opposite way rather quickly. So I didn't squeeze my counts into my biased beliefs. I would happily change the count of any of the above if it would fit better into EW theory rules and guidelines. But it doesn't at this time so we go with what we have. 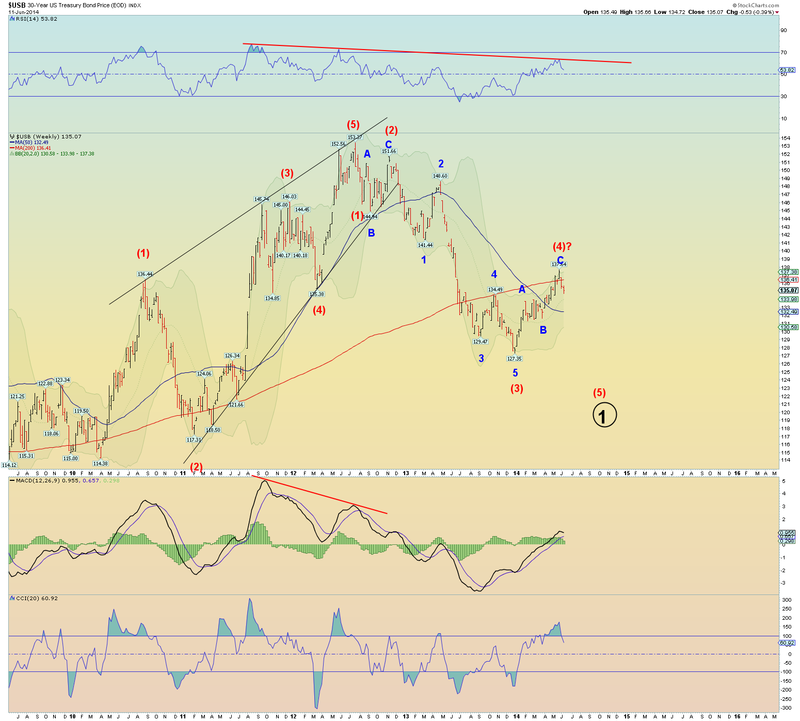 A last note is this: Cycle wave b has morphed into a quite large "expanded flat" pattern for Supercycle wave (a). 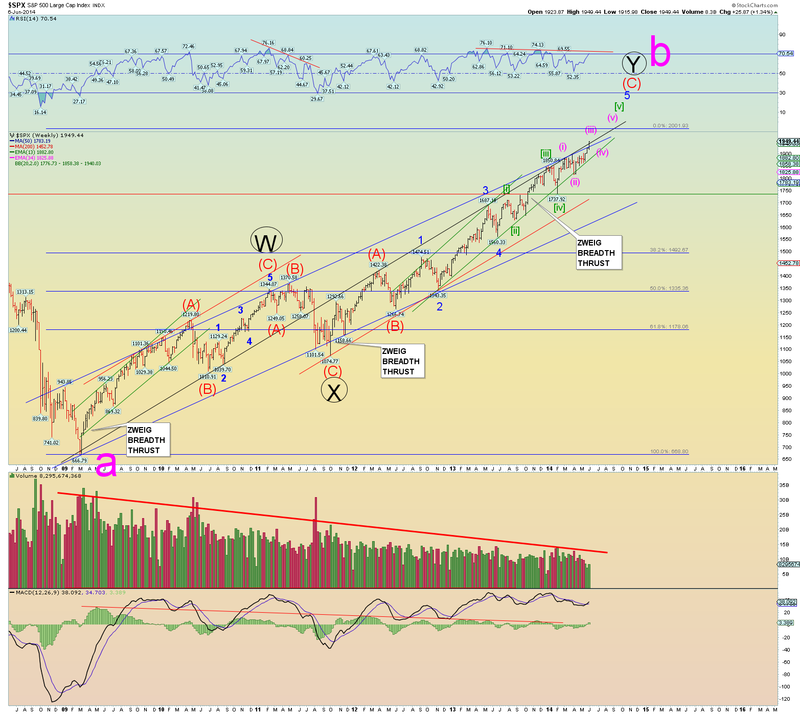 This implies that the final cycle wave c will carry prices far below the 666 SPX low. Again, this is not me pulling something out of a hat, this is how expanded flats count according to EW theory. So in the end although I am a very biased and bearish person underneath, it is only because the waves keep painting that bearish picture. 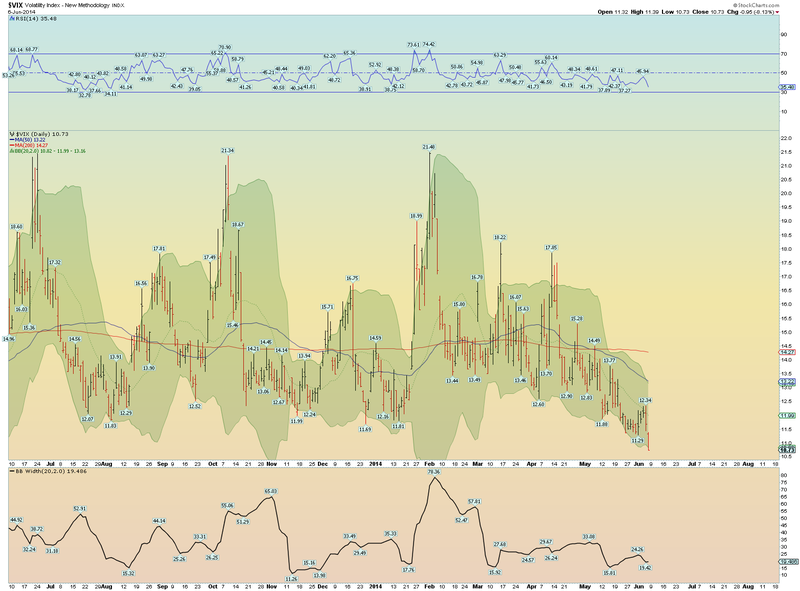 Cycle wave c is likely to be the credit bubble pop that has been building for 40 years. And it won't be pretty. Again, this is probably the best count we have going. 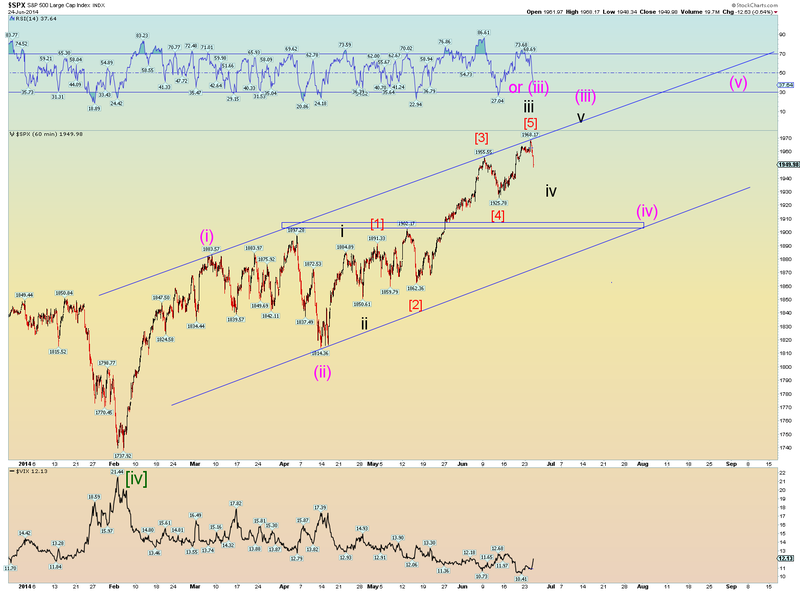 This implies that we are looking for the peak of wave (iii) of [v] of 5, then likely a simple zigzag pullback since wave (ii) of [v] of 5 was a somewhat complex sideways correction so we can expect something simpler for wave (iv). After wave (iv) onto wave (v) of [v] of 5. These are how extended wave 5's must play out. 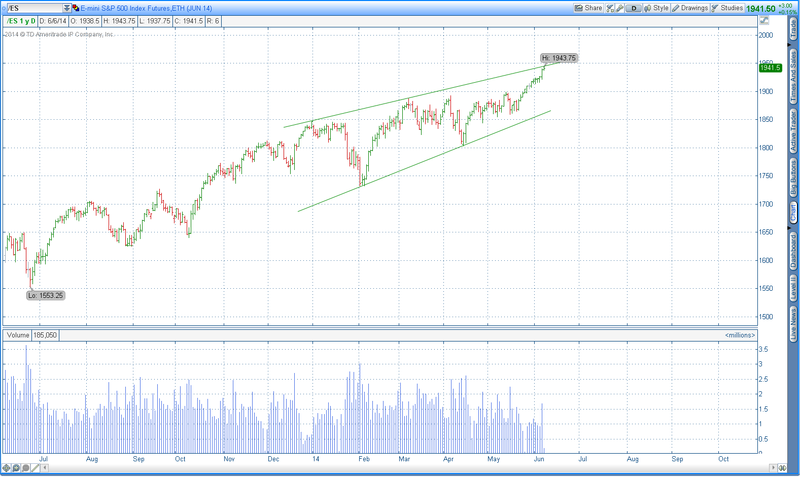 There are more than a few ways to count the tight channel uptrend that started in June of 2012.